Big Fish Little Fish finds a permanent home in Machynlleth! We can't wait to get dancing with Machynlleth under 4's this term as Big Fish Little Fish take on a weekly slot at Y Plas in Machynlleth. Along with our already popular under 4's dance classes in Llandrindod and Talgarth, our Mach session will start next week and we cannot wait! The lovely Clara will be dancing with you all every Tuesday 1.30 - 2.30pm at Y Plas in Machynlleth and looks forward to running a regular session, filled with fun, play, games, dance, music and of course some parachute play. 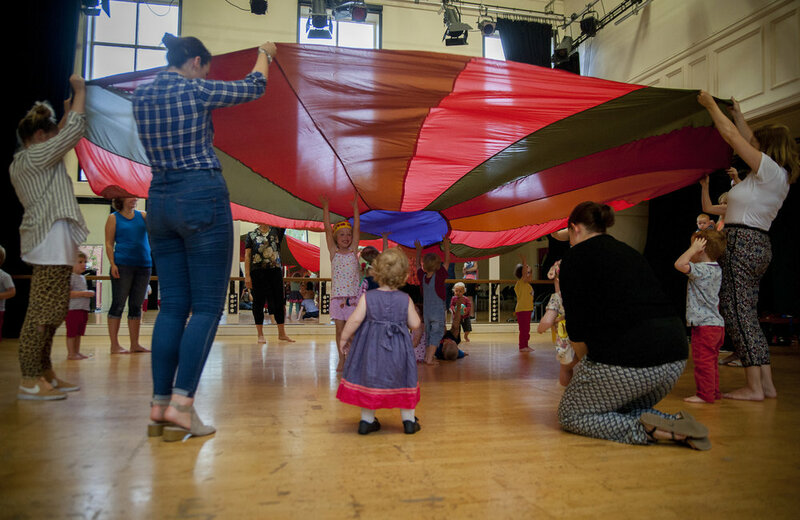 Encouraging creativity, movement development and letting little ones find a safe place to be curious about the world through dance with their accompanying big person! You can turn up and drop in when you can or alternatively you can pay for the term online!